We’ve had to change our shopping routine for the first time in many moons. The Goodwill bins now open at 10am officially. We showed up a few minutes before 10, and waited twenty minutes with no sign of life. We got sick of standing in the cold, so now we aren’t going to the bins until after lunch. That gives us about an hour, more or less, to dig around. It was so much better when they actually opened at 9am—we were happy as pigs in clover, digging until lunch. I kind of get the feeling that our Goodwill doesn’t care if they make their bin customers unhappy, since they’re getting a deal. Time to pull up our big girl pants and deal! 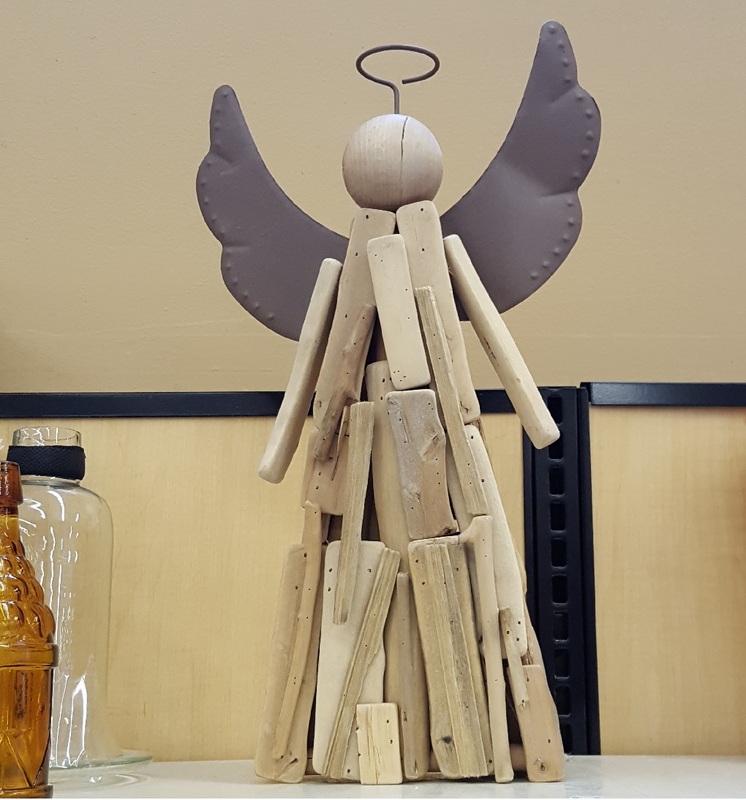 I named this “Driftwood Angel” and it might come in handy if it were impregnated with paraffin wax and you needed help starting a fire in a survival situation. As a decorative item, well … maybe you could … unstring it and play Jenga, which is lots of good, clean fun for the whole family. Those wings and the head would be tough, though. 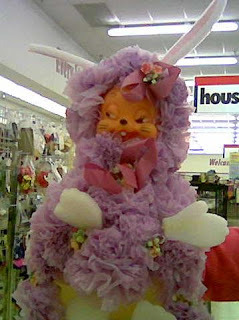 I’m guessing that at least some of you have seen those dolls made from dish soap bottles before. My mom and grandma made me a Santa and Mrs. Santa set for Christmas one year and I love them. I don’t always put them out because I had a dog that licked their hair obsessively! Now, their hair smells like dog spit to other dogs and this has caused further problems. But, somehow, Santa dolls seem okay to me, and this couple is not okay. For one thing, you put Christmas decorations out for a while, and then they’re gone for eleven months. I’m guessing these were out all year long—uff da! Maybe the original maker should have used accessible liquor bottles as the base; they could drive you to drink and then provide a drink. Seems fair. I know burlap was recently in fashion, and I still see it at craft stores. I kind of like plain brown burlap things as an accent. However, harvest gold burlap, not so much. I feel sort of bad for these embroidered topiaries. If they were on cotton guest towels, or a dresser scarf, they would be cute. This framing does them no favors. When I was working on the photo, I could see that the oblong openings aren’t even cut right. I cut like this after several cups of coffee, which is why I leave it to professionals, or at least trace a pattern and cut it after the caffeine wears off. It was a great big hunk for $3,99, which is a steal. Sadly, the pattern is too big for dolly uses, and they are the only ones I will deal with brocade for. It seriously would have made a couple of really cool pillows, if you were so inclined. 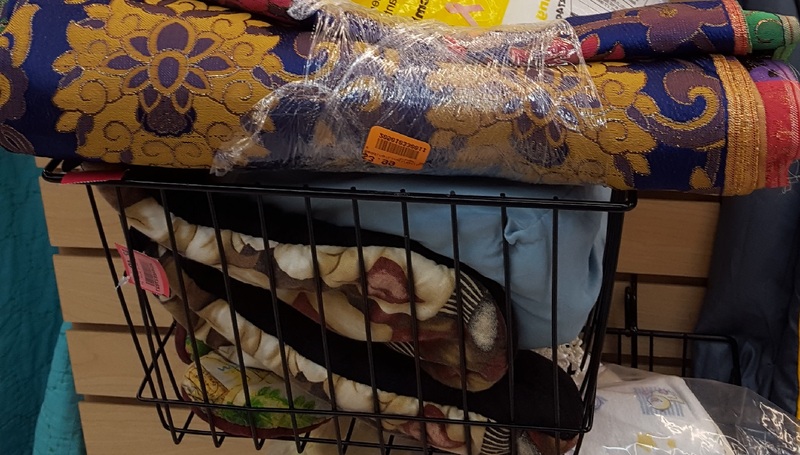 It amazes us how often we see super expensive fabric at thrift stores. The only problem is that you can’t choose the color or pattern. Not this time! 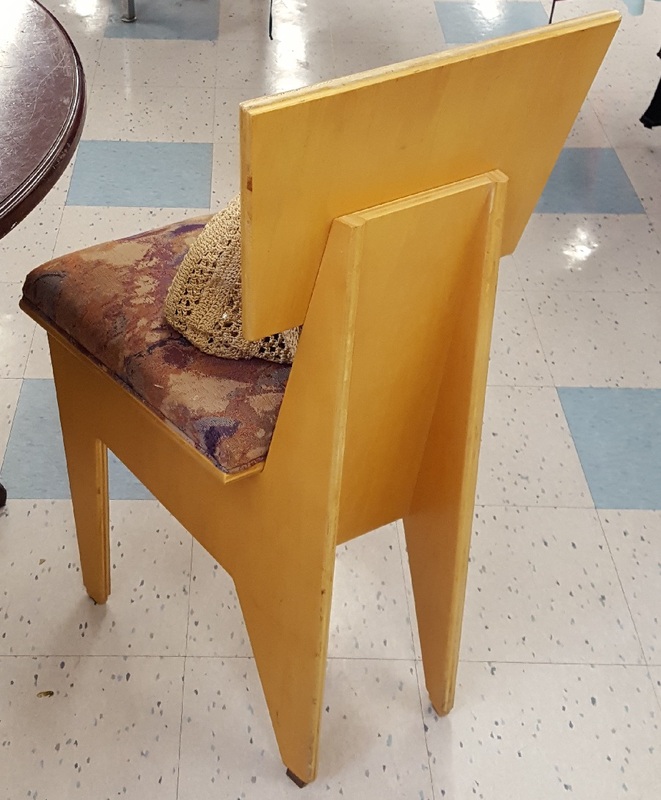 We both really liked this set of four chairs, made from plywood, I think. It was good plywood, since the grain was small, and they were so heavy that it took both hands to move them. They have a really cool style, sort of mid-century modern, although those cushions would have to go. We left them for the next person who might actually need chairs and wouldn’t have to wedge them into their house. 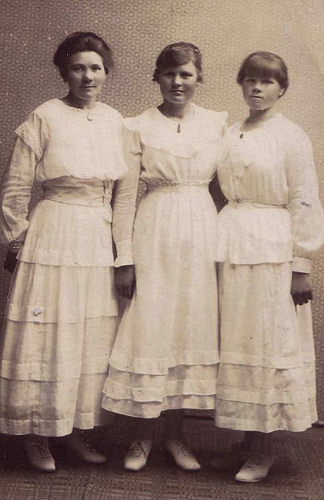 The story of the picture is that Sine/Stine and Marie Jensen’s mother died leaving their father with three girls under four years old. The girls were divided among family/others but their father never remarried or contacted them again as far as she knows. Obviously, two of the girls were together. Sandi’s grandmother, Sine/Stine came to Iowa and married. She died at 27 after having two little girls, and her things were put into a box which wasn’t opened for 80 years! This picture was in that box and the family in Denmark haven’t seen it before, although Sandi did meet her Aunt Marie, who married Viggo Christensen, on a trip to Denmark in 1963. Families ties and records were so fragile back then. Who knows what might happen if someone searches those names linked to Damgaards or Denmark? Back to the picture. I was wondering if tiered skirts were a thing because you wore your clothes for so long. If you happened to get too tall for a skirt, they would add another layer with some lace to make it longer. You could fix damage to the skirt this way, too. It might also be to accommodate different styles, or to “freshen” up an older outfit. Considering how many clothes we own these days, it’s hard to imagine having to plan on keeping an outfit for years and fixing it. We love hearing stories from readers. If you have anything to add to one of our posts, don’t be shy; we love to share pictures and stories. 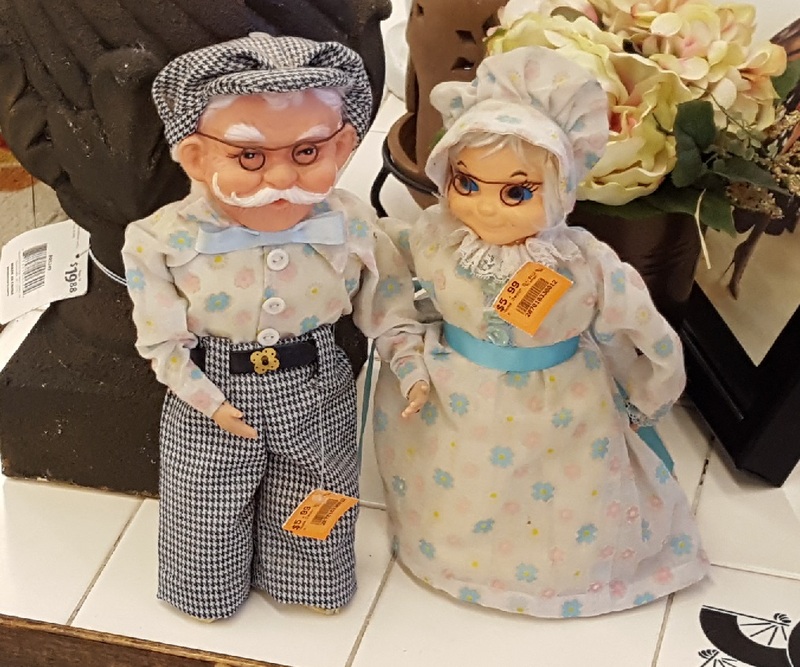 This entry was posted in Friday Finds and tagged Angels/Cherubs, Crafts Gone Wrong, Figurines, Furniture, Pictures, Thrift Store, Vintage. Bookmark the permalink. We loved the story of Sandi’s family too, although it’s pretty sad. Sandi had hit a dead end with some of her genealogical research, so we’re hoping that someday someone will type the town or family name in Google and get directed to us. Never hurts to have some keywords on the interweb. Love the dog-licking-Santa-hair story….I can just imagine the domino effect of issues! 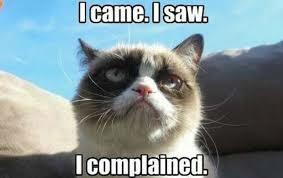 But it made me laugh. And I love the photo of Sandi’s relatives and the story – this sort of thing is endlessly interesting to me, even if I’m not related! I enjoy the whole family history thing, especially when old clothing is involved. Yes, clothing got used and re-used and pieced together and cut up and recreated. Amazing how long one item of clothing could be used for, and then cut up to patch and extend. I tend to wear my clothing until it’s well worn, and can imagine dresses with tiers might be very useful for all the reasons you listed! Thanks for an interesting post! Glad you found Sandi’s family story interesting–it’s quite a mystery what happened to the other sister. Thanks for letting us know you liked the post–we enjoy our reader’s feedback. Have a great weekend! 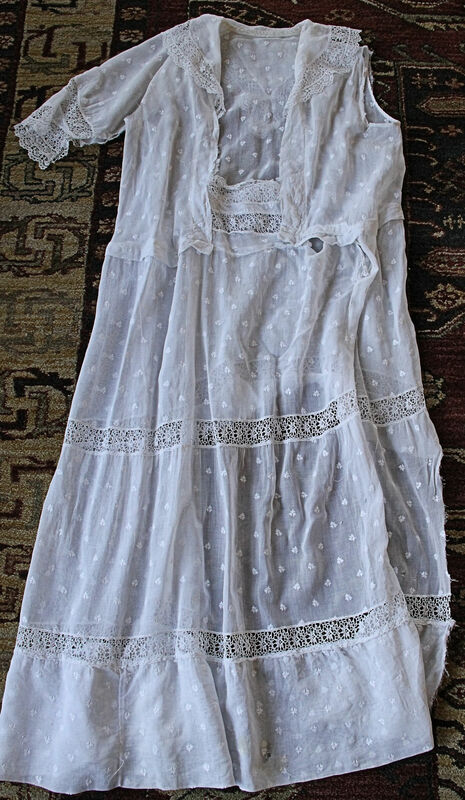 Thanks so much for posting the family story—I just found the resemblances to your dress so very close. I love all your bits of hysterical fun…and I never did understand the burlap craze at all. Thanks again, and my grandmother Nellie, would be honored to have her picture up. Thank you for sharing the picture and your family’s story. Have you thought of doing one of those dna sites that also will search for matches within their data bases? A friend of my husband has found several family members that he knew nothing. He was adopted and an only child and wanted to know if he had sibs out there. gee, my mom had embroidered a set of those same topiaries. 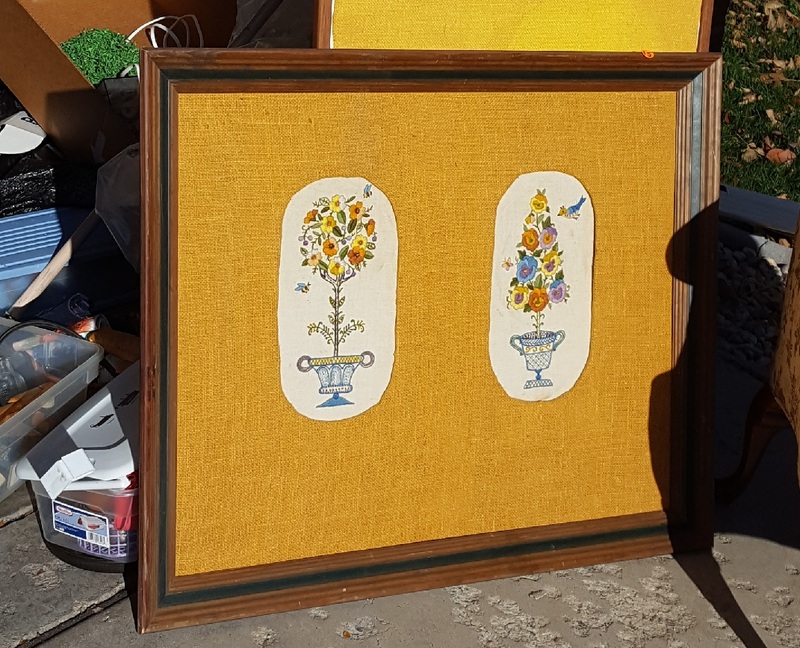 she put them in two separate frames though. no crazy matting. much better that way. See, we would have liked that. Those poor topiaries deserved better! Thanks for sharing.